Functional Neural Transplantation IV: Translation to Clinical Application, Volume 230 provides the current status of cell transplantation in the nervous system, with a focus on the conditions for achieving structural repair and functional recovery after brain damage or in neurodegenerative disease. 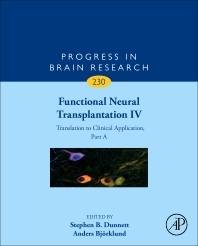 New to this release are chapters that delve into the Mechanisms and Use of Neural Transplants for Brain Repair, Reprogramming of Somatic Cells: iPS and iN Cells, Brain Repair from Intrinsic Cell Sources: Turning Reactive Glia into Neurons, and Ex Vivo Gene Therapy for the Treatment of Neurological Disorders, Preparation, Characterization and Banking of Clinical-grade Cells for Neural Transplantation. As the fourth in a periodic series of updates at 5-7 year intervals, this volume highlights recent developments related to the application of advances in cellular and molecular science, providing an understanding of the fundamental principles of neuroplasticity and regeneration in the brain and spinal cord, and also addressing the topic of the power of pluripotent stem cells to generate new sources of precisely specified neurons for utilization in brain repair. Dunnett is a behavioural neuroscientist who started a lifelong collaboration with the Björklund team in 1979 to explore the functional consequences of cell transplantation method in animal models of neurodegenerative disease, in particular involving cell replacement and repair of the basal ganglia. He has developed models and novel methods of motor and cognitive assessment to apply behavioural analysis not simply to assess functional efficacy of implanted cells, but as a tool to study the mechanisms of cell integration, circuit reconstruction and functional repair. In parallel his laboratory originated the first UK trial of cell transplantation in Huntington’s disease, and provides the source of clinical grade cells for further ongoing trials in Parkinson’s disease.